I’m honored to be featured in this blog with video by Mitchell Osborn! We have an exceptionally powerful gateway on November 11, 2015, with the added energies of a new moon. This day brings an incredible opportunity for new beginnings and to amplify our intuition and release fears to reveal and live in our authentic soul mission, further helping many others do the same, living as One in Unity. Read more and watch the video by following the link below! 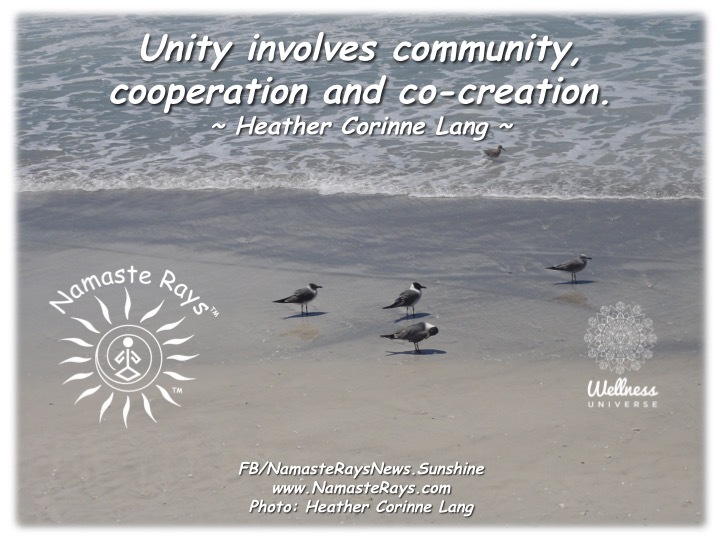 Unity involves community, cooperation and co-creation. The world needs more Unity. We have lived in separateness for a very long time. We have learned to feed the ego versus the soul. Many are more concerned with fear and lack, than the abundance and prosperity the Universe wishes to deliver. The ego and soul need be balanced, along with the energies of the World, of our Mother Earth. The soul needs to be in the lead, while the ego comfortably follows as an expression of our soul and personality. Many are more involved with competition versus cooperation. We need to grasp the concept of abundance, as we learn more and more to release our fears of the illusion of lack. As we do, more prosperity will be showered on All. We need to remove the illusion of separateness and adopt trust in togetherness & union. It is important that we all fully accept, comprehend and work with the concept of community, cooperation and co-creation. To be a more harmonious and balanced world, we all need to learn how to function as a Whole, connected and interconnected with all of Nature – both Human Nature and Mother Nature, as we are both Human and Nature. Working in cooperation as One World community, co-creating a well-balanced, healthy and loving place to live is the goal light workers, light bearers and light warriors, who are all striving to manifest this paradise with each other and with All. We need to release the need to be “better” or the “the best”, leaving competition behind as it harms the meaning of community and co-creation. Competition designed for play, learning and growth, is healthy, but to fuel the ego is not. Unity is all about community and sharing, because we each are one expression of the Divine, working together as The Divine. The world needs all of our unique gifts, talents & passions. The reality of community is for you to share and give of yourself, while others will share and give to you. This is creating more prosperity, manifesting the endless amounts of abundance for each and everyone. We all need to cooperate in our environments, learning to live in peace & serenity with each other and all of Nature. We need to recognize, believe and accept that co-creation as a team, brings more abundance and prosperity to all. We are all ONE, connected by The Source. The Divine is within us all and we are all the Divine as One. We are different expressions of Divine, yet we are all meant to co-habitat and co-create in Love and Light. Unity involves all of us understanding that we are all beautiful, wonderful and shining souls on our individual learning journeys, yet also interconnected on our paths to both learn and teach. Ultimately seeing the Light within each individual is the connecting factor. When more of us live in this way, the world will transform and ascend to higher vibrational frequencies of Light, Love & Peace. Committing ourselves to the creation of community, cooperation and co-creation brings us together to manifest a beautiful oasis on Planet Earth, our Mother Gaia. This is a blending of everyone recognizing we are all the same within our soul lights to experience the heaven on earth. Co-creation at its finest is knowing one person cannot do everything, yet every person can do something. The uniqueness of every individual is then utilized for the highest good of All, each shining in our unique blessings, doing what we most love to do for ourselves and for each other in Unity, Togetherness and Wholeness. May you awaken to Unity. With the Super New Moon and Solar Eclipse, allow the fresh new energies to pour into you, helping you manifest your deepest desires, dreams and wishes. 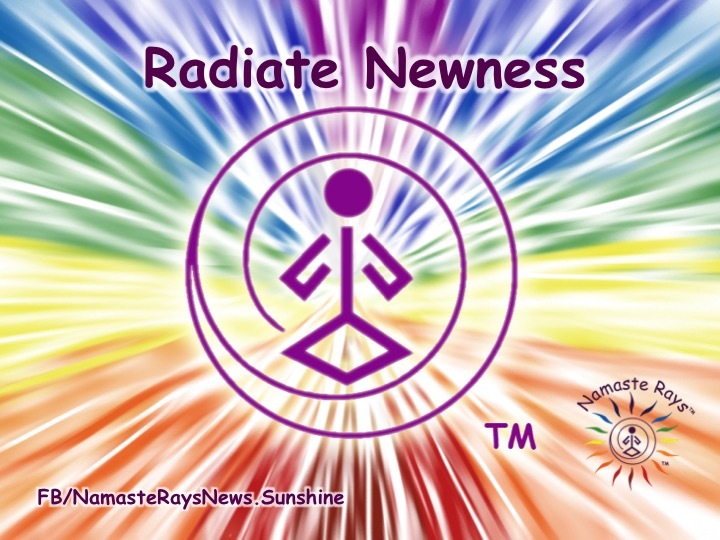 Use these energies to create the “newness” in your life, whether it’s a new love, new career, new way of thinking, new home, new book, new group or new diet. Think, act, speak and work towards new beginnings. Whatever it is you want in your life, now is the time to work on it! And, with the Spring Equinox in the Northern Hemisphere, even more potent new beginnings are on their way. When you help co-create your life with the universe, your higher self and possibly others, the opportunities will keep arriving for you to consider. These new beginnings are yours to establish the life you truly want to live! P.S. If you need assistance or guidance in any area of your life, please contact me for an appointment. Through my services we can help direct you, help you release & let go and help you heal yourself to be open to all the new possibilities. At the beginning of my yoga classes, I remind the attendees of several things, and one of them is “There is no judging or comparing.” I have further explained it from time to time to mean there is no judging or comparing yourself and your poses against the persons next to you, or against yourself from what you may have done last class, last week or yesterday. I tell them you are doing the pose in the way it’s meant for you right now. These statements are true every day in every moment in all situations. No one is any better or worse than you at anything. It’s simply different. We all have different bodies, so in yoga, each body will do the pose in the manner that is perfect in that moment. Striving to stretch further or moving deeper in a pose is part of the practice of yoga. Different bodies will achieve different poses at different times. Again, it’s a practice. 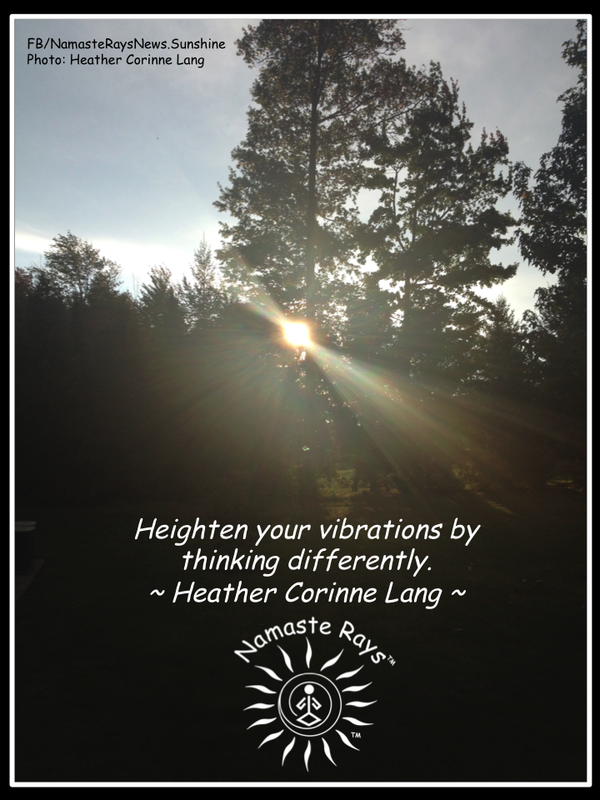 Heighten your vibrations by thinking differently. Applying this in all facets of life will heighten your vibration, as judging and comparing not only brings your vibration down, it brings the other person’s down as well. Remember we exchange and share energy all the time, so one thought changes a vibration, and the vibrations of those who come in contact with you. Raise your vibration by simply thinking differently. Thinking differently is looking for the similarities, while accepting the differences. Two people can both be in warrior pose, feeling the strength and power of the pose. The similarity is same pose. One person may have their legs closer together, while the other has them further apart. That doesn’t make one person’s warrior any better than the other’s. It simply makes them different, and each person is doing what their body can do in that moment. It’s about letting go of harmful thoughts. If you think “That person is doing it better than me”, it creates harm and brings the vibrational energy down. Instead think “I am in this pose” without attaching a label of “well” or “good” either. In yoga class I give minor instructions so we can adjust our bodies for the pose we are doing in that moment so each person finds the balance and comfort in their pose, and this brings awareness to themselves and heightens vibrations by recognizing their bodies and the pose which feels right for them. Remember all self-talk carries vibration. Pay attention to your thoughts and notice when you are comparing or judging. “That person has more money than me.” Is this simply a statement, or is it a comparison? How can it be changed? Much of our comparisons and judgements are based on perceptions. It’s important to note perceptions are not the whole story. So, exactly how do you know this person has more money than you? Why do you care? What are needing to recognize about yourself in relation to this statement? This statement is about lack. This statement because of it’s energy creates more lack. The law of attraction and the law of abundance give you what you think. If you think “lack”, your abundance will be somehow lacking. This thought is attracting more lack. Cancel the thought. Then think “I have abundance, I have a lot of money, I am prosperous.” You are no longer comparing yourself to someone else. You are recognizing how to raise your vibration and by using these positive statements you are raising your vibration, by removing “lack” and bringing in abundance. No comparing, no judging. Cancel those thoughts by literally thinking “CANCEL”! Then use your I AM statements. Your I AM statements are your mantras, repeat often and as necessary. Raise your vibrations! And by raising yours, you will touch the energy of others, helping them raise their vibrations. May you raise your vibrations each and every moment. During the past few weeks it was become increasingly clear to me to practice positive thinking more and more. (And I apologize for not being able to blog every week as I have had time to do before as these past weeks were very busy in many different aspects.) It is important to only accept the very best outcome for you and others. Does this mean the outcome might not be what you wanted? Perhaps. But it will be the best outcome for our learning experiences and for our higher good at that time. BUT we still need to hold the thought that we are expecting the very best outcome…the biggest dream and more, not limiting ourselves in any fashion. 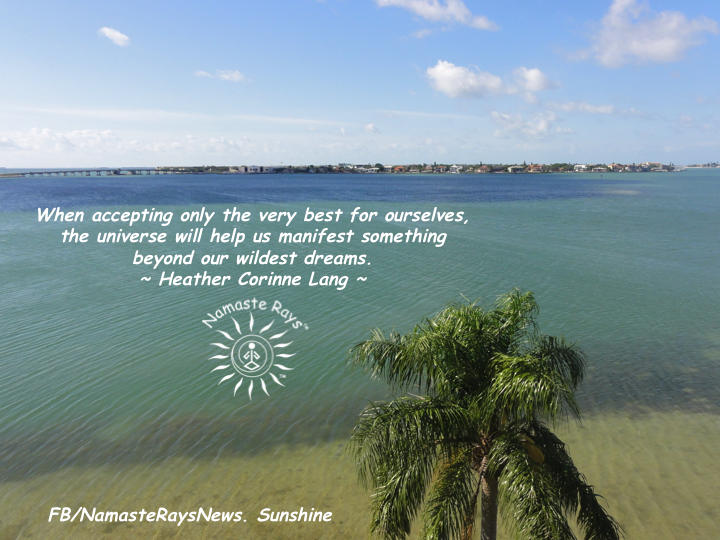 When accepting only the very best for ourselves, the universe will help us manifest something beyond our wildest dreams. When we compromise, or even worry about a less than acceptable outcome, it keeps our true heart’s desires from manifesting. It’s important to remember, the Law of Attraction does not label our thoughts, feelings or actions/reactions as “good” for us or “bad” for us. It just attracts. Like attracts like. What are you attracting with your thoughts? I know I’ve written about this before, but it’s even more important in this highly energetic time to think only thoughts which will bring us to the blessings and miracles we have been hoping for, praying for and wishing for. Compromise means coming making concessions to come to an agreeable settlement. This works in some situations, like business scenarios, but in our own lives, why are we compromising for less than we deserve? Compromise also means accepting something that is less than desirable. Again, why do we do this to ourselves? The energies of this month have been difficult, but the challenge to us was to continue focusing on what we want and what we deserve in our life. We all deserve abundance, prosperity, love, security, safety, kindness, compassion, etc. We must accept only what is best for us and reject what is not. Thinking and accepting what is in our now helps with our peace of mind. I have also spoken of this in the past. Remember, accepting what IS in the Now, is about accepting the lesson of the situation which is for our higher good, even if we think the situation is not something we should be dealing with at this time. Look at the situation, and figure out for you how to turn it back into a positive situation, which will then lead you to accepting only the best outcome of that situation, while in the situation. For instance, if you have been hurt by an imbalance, accept only that you will heal 100%. If you are stretching your dollars, accept that the dollars will stretch and multiply. This is the only perfect outcome for you. It’s having the faith and belief you will always have everything you need AND more. I had a breakfast meeting just this past week with someone I’ve known for quite some time. We were discussing many things, but one topic in particular about dreaming big when thinking about where you want to be in your life was very notable. This person said to me he would ask employees “where do you want to be in 5 years…take your time, as you don’t have to tell me.” The other person would then tell him after thinking for some time where they wanted to be. He said he would tell them “forget that now…think BIGGER.” In essence, expand your dreams and wishes! When we only accept the very best for us, without limiting our own beliefs about what that will be is when the universe blesses you with more than you ever could have dreamed possible. It’s about accepting what you have, AND AT THE SAME TIME, only accepting the very best which is waiting to be delivered to you once your worry and compromising stops about the “opposite” outcome. May you only expect and accept the very best…and MORE! What do you see when you look in a mirror? What do others see? Most importantly, what do you see in others which reflects you? As infants grow, they imitate the parents, older siblings and others in their life. And most of us find this incredibly interesting and fun. Yet, when that same child imitates a negative aspect we may have exposed to them, it’s not so fun anymore. We are teaching the child to mirror us, so when they are learning, they are depicting what they see in others. We then see the child form it’s own actions, and then learning to speak begins. They also use words we use with them. And, then as they mature, they find their own words. This pattern repeats until we seemingly know ourselves. But, do we? Have we discovered our true self? We have also learned to hide traits which aren’t part of the mainstream, or are different than our “tribe”, our family, our friends. But to truly find our highest, true self, it’s important to keep learning and growing. 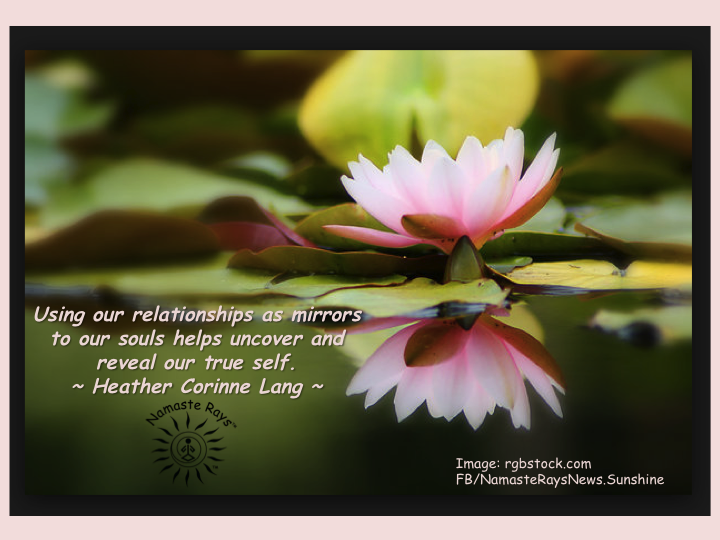 Using our relationships as mirrors to our souls helps uncover and reveal our true self. First we must detach from how a trait in someone makes us feel and just observe. Detaching because we will see things which aren’t “fun”. Like a baby imitating others, just find the imitation, whatever it happens to be. Detaching and observing, leaves us open to closely and carefully examine the aspect we’ve seen and mirrored. Without attaching any labels to it (i.e., like, dislike), we now understand something new about ourselves, or something we hadn’t before wished to see. We have uncovered and revealed a trait to ourselves. This is the learning process. By then accepting this trait, we can either strengthen it, or change it. This is the growing process. How do we change a trait? Many different ways exist, but it’s a mindset. It’s about being very aware about each and every thought you have and thinking about them. Analyzing them. Understanding them. And, then changing the thought. With practice, you notice you are having “that thought” and you change it, after awhile, you will find you have changed the thought…thus the trait. You have uncovered a part of your true self, changed it and now can reveal it to others. Continually looking into another as a reflection of you with detachment and openness allows you to uncover your truths one by one, learning and growing into your true self. Your highest self. Your best self. Your authentic self. Your true shining reflection of your inner soul. Noting you are also a mirror for others, your actions are helping others to see something in you that is in themselves. Their true self. May your mirror others to find your true reflection and shine! Need guidance uncovering your true self? Contact me for Intuitive Healing Guidance, a blend of energy healing and life coaching. Do you often find yourself saying “I don’t have the time to do what I truly want to do?” If you don’t have enough “time”, then what are you doing with the time you have? Enough time exists for you to do exactly as you choose to do. You make the choices. You are in charge of your life, thus the way you spend your time. I found myself just yesterday telling a friend “I don’t have the time I used to have to do what I really want to do.” After discussing it, she revealed she had said and done the same thing. She evaluated what she was doing with the 15 or 30 minute intervals she had, which wasn’t much. She would wait until she had enough “time” to do something, versus using those smaller intervals to do part of the larger project. This struck a chord with me…loudly. I have done the same thing my entire life. I wait until I have “enough time” to do what I want. If I feel it will take about an hour, I wait until I have an entire hour. Instead, I could have accomplished it much sooner by using the 15 minute intervals I find myself doing things like checking Facebook or playing games on the phone, both of wish I also enjoy, but I was making the excuse that I didn’t have time. Of course I have the time! I was making a choice. Even for leisure activities. I love to read . I haven’t really made the time to read. What else was I doing? I was watching tv! Well, turn off the tv and read! I did just that yesterday. I was watching the Olympics in the middle of the afternoon. I turned off the tv and finished a book I’ve been reading for months! I wasn’t reading it 15 minutes here or 15 minutes there, but waiting until I had sufficient time to read. 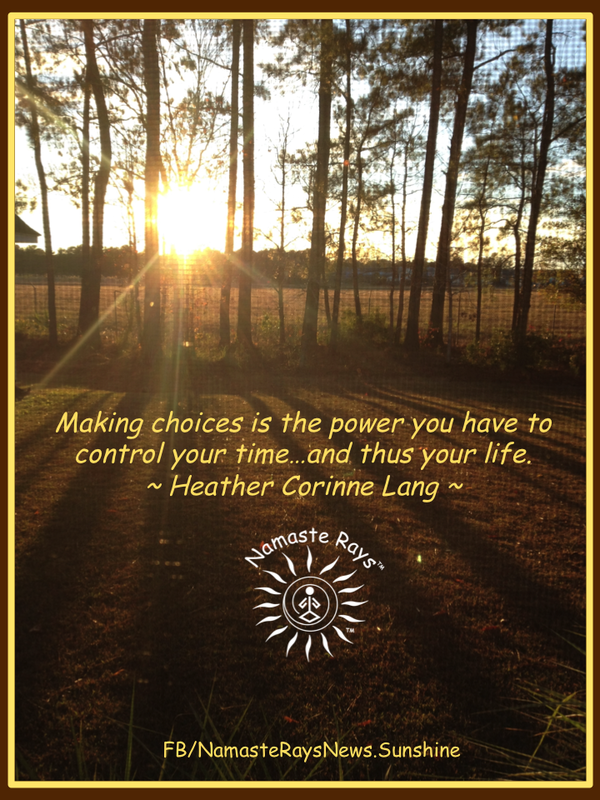 Making choices is the power you have to control your time…and thus your life. We all have plenty of time to do as we wish each and every day. It’s about choices. Those choices are how we guide our life. What choices do you have right now? What choices have you made in the past and what choices do you wish to make instead? Which choices are the ones which will help you on your personal journey? Whether those choices are reading for pleasure, playing a game, talking to a friend, exercising, working on your own business or any myriad of things, make the best choice for you at that time and FOR that time. The opportunities present themselves to you, in time. Be open to the possibilities…the choices you have, and control your life! May you allow the choices you make to mold your time & life! Curiosity didn’t kill the cat. Curiosity creates an opening for more knowledge. More knowledge leads to more wisdom. What does “kill the cat”? Closed mindedness. This is what “kills the cat.” The cat, our soul. Not being inquisitive kills our soul. 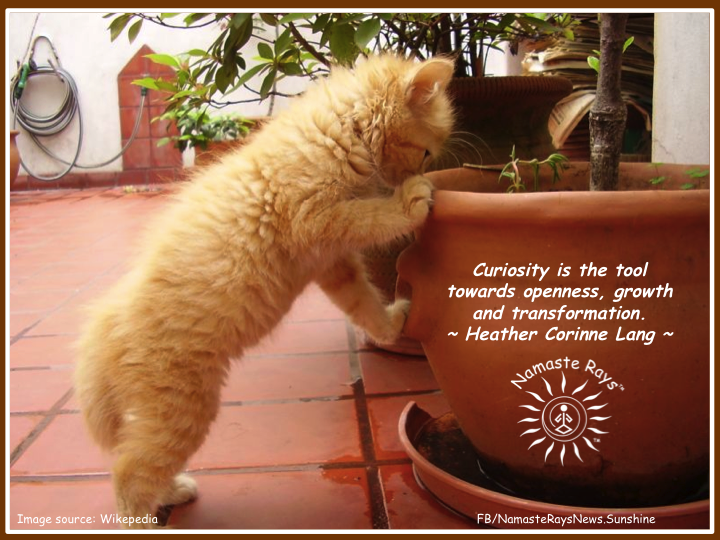 Curiosity is the tool towards openness, growth and transformation. Our souls strive to learn more and connect with new lessons. New lessons for our soul’s growth & transformation. Curiosity is an extremely admirable trait. I highly admire my 10-year old niece. Not only do I admire her, at 47 years on this earth, I strive to be more like her. More inquisitive. She is truly one of the most inquisitive soul’s I’ve ever met. Definitely an old soul, yet, she is continually and constantly asking questions. She can “act her age”, however, she really never pretends to know something if she doesn’t know it. She uses the tool of questioning to learn more and to understand. While her younger siblings are off playing, she is listening to the adults, asking questions, participating in the conversation and becoming more intelligent. She is truly growing not only physically, but mentally, emotionally and spiritually. It’s quite a sight. (Yes, I’m quite the proud Auntie/God-Mama!) She has been doing this since she learned to talk. Many children grow out of this stage, and as adults, many of us forget what it felt like to crave knowledge. We think we know everything. Do you? Do you truly know everything? When did you stop asking questions? Why did you stop asking questions? Are you afraid someone may think you un-intelligent? Or perhaps “ignorant”? There is nothing wrong with being ignorant. Ignorant means you simply do not know. You didn’t learn something. That’s all. The “negative connotation” associated with this word in today’s society needs to be removed from your mind. Removing the attachment to the negativity of a word, such as “ignorant”, “un-educated”, or “un-informed”, creates an open mind. With an open mind, you can become curious and ask questions. By being inquisitive, you will learn more and thus, grow. You will no longer be suffocating the soul…you will be feeding your soul. And, this will lead you to learn more about your true spiritual purpose. May you feed your soul with curiosity! Competition. Why do we compete? What is it that creates this need to be better than anyone else? To be the “winner”? To be the “best”? What are you attempting to gain? What are you attempting to hide? What are you trying to feel? Our society feeds on competition. This need to be better than anyone else. To be the top dog. The best athlete. The winning team. The better nation. And, we pay people who buy into the competition need. The best pitcher tends to get the most money on the best team. The teams fight over who gets the best player. The Valedictorian. The best employee. How does it make us feel when we are not better than someone else? Do you feel neglected? Unimportant? Fearful no one will like you? Anxious? Stressed? Upset? What is the driving need to be better than anyone else? Or someone else? When we continue to buy into competition, we are fueling drama. We are fueling dueling. We are fueling our egos. We are judging and comparing. If we take that same energy and discover what we can do better today in our own being, we then can create inner joy & love of ourselves. This inner joy & love then radiates outwards. We then become a magnet for more abundance in our lives. More love & joy. We are working towards being our best self. And, when we are working at ourselves, drama stops. Fighting stops. We no longer are feeding our egos, but we are feeding our souls. This brilliant energy of Love & Light transcends and helps us ascend towards the heaven on earth we can share with others. You are not competing with yourself, you are bettering yourself. You are not fighting with who you were yesterday, you are accepting who you were yesterday, and realizing you are able to change that person for the better. Like the Fire Dragon, let out your inner fires to burn brightly and rise above all that is not who you truly are at heart. By fueling our inner souls, we become better than who we were yesterday.Our hopes and dreams begin to manifest. Our wishes start to come true. The love we crave is found within. The happiness we’ve wanted is ours for the taking. It’s all within us. It’s not outside of us by competing with others. It’s encouraging others. It’s helping others. It’s showing others it’s more important to cultivate a more balanced and centered self. It’s helping lead the way to a more balanced and centered society. It’s being the example of true Love & Light. It’s becoming One with the entire self, the higher self, the best self. It’s reveling and celebrating the wonderful, unique, talented and gifted person you already are within you. 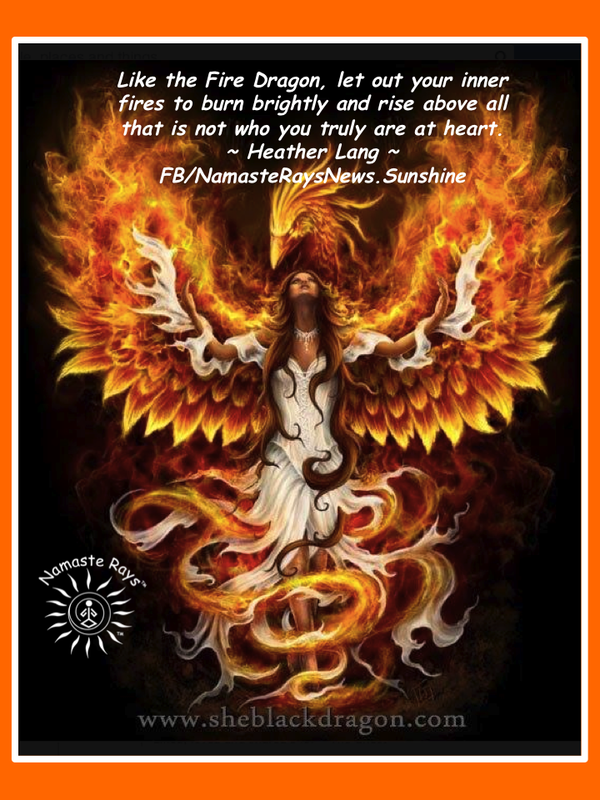 You are simply changing from one way to another way and letting the higher self burn brightly. May you use your energy to better yourself.